I’m definitely doing this challenge at the last minute – I decided to start the day it was due. I literally just finished plating one for the photo above! Normally, this wouldn’t be too much of an issue, but this time, I opted to make a dairy-free cream using a technique I’d never tried before. It was indeed an experiment – one I hoped I could pull off! The June 2010 Daring Bakers’ challenge was hosted by Dawn of Doable and Delicious. Dawn challenged the Daring Bakers to make Chocolate Pavlovas and Chocolate Mascarpone Mousse. The challenge recipe is based on a recipe from the book Chocolate Epiphany by Francois Payard. I was excited that the challenge was naturally gluten-free. Hooray – less substitutions! However, the chocolate mascarpone mousse was not dairy-free. It called for cream and mascarpone cheese. Creating a substitute was something I contemplated for quite a few days. I knew that I saw a dairy-free cream cheese at the store, made from tofu. I strongly considered using that and coconut milk as a substitute for the cream, and following the rest of the recipe as written. I even picked up the tofu cream cheese at the store and carried to the checkout line. It was then that I decided I didn’t want it – I am not fond of the flavor of most soymilk products, and I really didn’t want to use tofu cream cheese. I put it back. I would come up with another idea. A few days later, Noelle of An Opera Singer in the Kitchen turned me on to this raw, vegan, dairy-free cheesecake made from soaked cashews. (Available at Earth Cafe) Noelle insisted that those cheesecakes were amazing, and I was convinced that in the near future, I’d be ordering one to see for myself. Meanwhile, she also shared with me a new blog to check out, The Daily Raw Cafe, where a similar cheesecake recipe could be found. I was inspired. 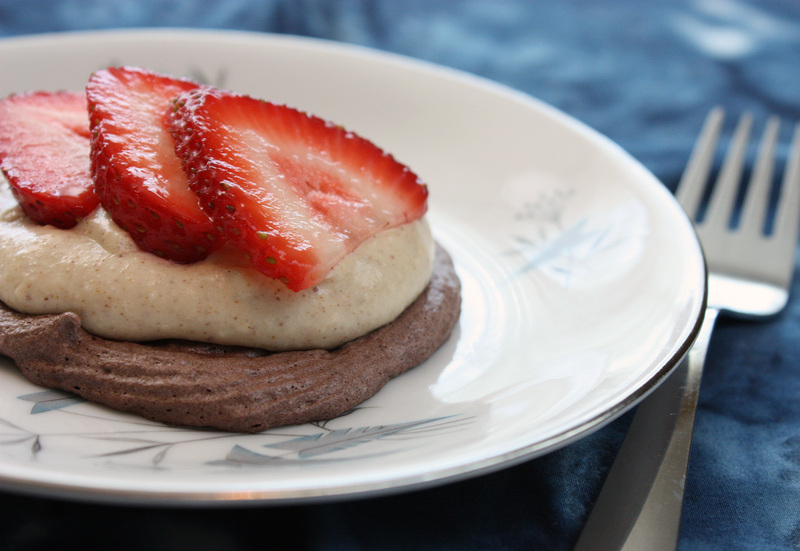 Instead of making a chocolate mascarpone mousse, I opted for something a touch lighter – almond butter cream and strawberries. I set to make the cream, soaking cashews and blending them, adding coconut milk, almond butter, lemon…and the resulting texture and flavor of this cream was silky and rich. I can only imagine how lovely this would taste in a cheesecake – it was lovely here. My pavlovas were piped a bit thinner than I’m used to. (The last time I made a pavlova, it was a more traditionally large, fluffy cake-like dessert) However, they were deliciously crisp and chewy, with a lovely chocolate marshmallow-like flavor. Topped with the rich cream and fresh strawberries, this was indeed a lovely summer dessert. I would love to try this again, making a large pavlova next time around. A bit thanks to Dawn for this month’s challenge! Place two racks in the upper and lower thirds of the oven and preheat to 200 degrees F. Line two baking sheets with parchment or a Silpat and set aside. In a mixing bowl, whip the egg whites to soft peaks. Add the white sugar, 1 tablespoon at a time, whipping until the whites are stiff but not dry. Sift the powdered sugar and cocoa powder over the whites, and fold gently in. This will not appear as though it will blend at first, but keep folding and it will come together. Place into piping bag and pipe into desired shapes on the lined baking sheets. Alternatively, you can spoon out the meringue into circles and spread out evenly with the back of a spoon. Bake for 2-3 hours (I baked mine for 2), until crisp. Allow to cool. You can store these in an airtight container for up to 3 days. Soak the cashews in water for at least an hour. Drain and add cashews, agave nectar, vanilla and almond extracts, and the water, 1 tablespoon at a time, into a blender. Blend until creamy, and add the coconut milk, almond butter, lemon zest, juice, and salt. Blend until smooth. Place in a bowl covered with plastic wrap and store in freezer for 1 hour or until thick, stirring once or twice during that time. Top each pavlova with 1-2 tablespoons of the almond butter cream. Top with sliced strawberries and serve immediately. It dawned on me this morning that today was a significant day. One year ago today, I decided to go gluten-free for a 2-month trial. But unlike a previous attempt at a gluten-free diet, this time, I would be overly cautious. This time, I would give my body time to decide whether gluten was a problem. And when I “challenged” in August (Meaning I consumed gluten. Consumed is such an understatement. I scarfed down a roll, some bulgur salad, and a piece of chocolate cake. Yikes! ), I knew. All of those symptoms that had slowly abated came rushing back. 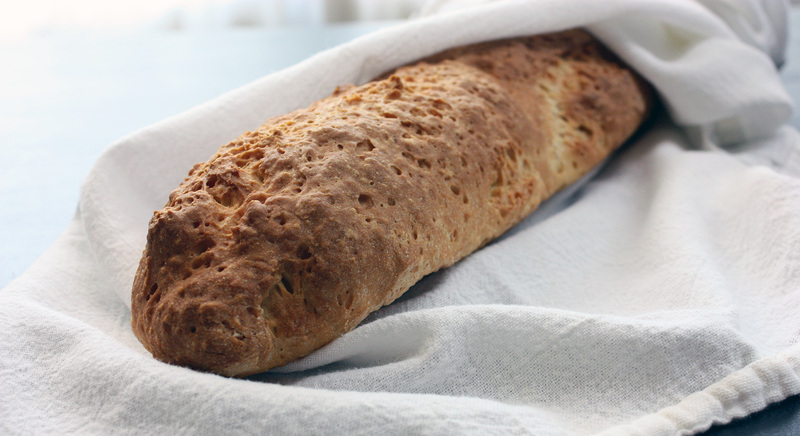 I was sick – sick enough to know for sure that for my body, gluten was the enemy. I would love to say that changing to a gluten-free diet was as simple as turning on a light switch. It wasn’t. I thought it would be relatively simple – after all, I have cooked for my Dad, brother, and sister many times, and they have all followed gluten-free diets for years. But cooking for someone once in a while and living the gluten-free life are two different things. There was indeed a learning curve – and I’m still learning. But I am still so thankful for making the decision to go gluten-free. While it’s definitely not a decision everyone should make, it has changed my life for the better. I thought I’d share some things I’ve learned during my journey this past year, in hopes that my lessons learned can help others that are just starting out. Start with fresh, whole, naturally gluten-free foods. This is not only easier to learn (there’s no label-reading on a piece of fresh fruit), it’s easier on a sensitive, still-healing digestive system. While it’s normal to want a gluten-free version of your favorite old gluten-filled dishes, it’s best for your body – and your wallet – to keep the purchase and consumption of processed, packaged, or even homemade gluten-free “replacement” foods to a minimum. Allow yourself to heal and nurture your body with real food. Speak up. I am not one to want to make a big deal out of things. I don’t like feeling as though I’m “high-maintenance”. When I visited a restaurant, or was invited to someone’s house, I didn’t like asking a bunch of questions about what was in the meal, how it was prepared, etc. I felt like I was drilling people. And at first, I paid the price for my lack of thoroughness. I learned the hard way that I must be an advocate for my health, and I couldn’t be shy about asking the required questions. Now, I have overcome this “shyness”. If I am going to eat someone else’s food, I ask a lot of questions. I have to. I remind myself to try to see it as an opportunity for education. If the restaurant is willing to listen carefully and accommodate me, and they come to understand my needs, it’s a win-win for both of us. I become a loyal, repeat customer for them, and I have a place where I can relax and enjoy my meal. When it comes to visiting friends, I feel it’s also an opportunity for education. I have some friends that are truly wonderful – they research and learn what is safe for me to eat, and have accommodated me. For that, I’m truly grateful. For those times when I’m unsure of the food, I make alternate plans for my meal, so I’m not taking chances on my health. Which brings me to my next point. Plan ahead. If you will be away from the house for a while, make sure you pack safe snacks or a meal. If you are traveling, make plans to bring snacks and even possibly meal components (or scope out a good grocery store, if possible, where you will be staying). This way, you won’t be so hungry that you are tempted to risk questionable meals. If you find yourself in a situation where you have to attend a dinner where none of the food being served is “safe”, then you will have a snack handy to enjoy, and you can still participate in the social aspects of the meal. Some good, portable snacks include: Lara Bars, KIND bars, fresh fruit, nuts and dried fruits, gluten-free crackers (I love Mary’s Gone Crackers), carrot and celery sticks, or even hard-boiled eggs. If you travel often, Shirley at Gluten-Free Easily travels often while following a gluten-free diet, and she navigates quite well! You might consider checking out her blog for some tips. Read labels carefully. Become intimately aware of where gluten lurks in processed foods. While eating processed foods all of the time isn’t good for anyone, for those with gluten intolerance, they can be particularly difficult. Gluten can turn up in a lot of things that you wouldn’t expect – vitamins, shampoo, lipstick, condiments, broths, sauces, marinades, spices, etc. There are a lot of ingredients listed on labels that may mean that the item contains gluten, but those ingredients are not always obvious. There is a helpful list here to help you determine whether an item is safe. If you are still unsure, don’t use the item. You can contact the manufacturer for more information, or you can also use resources to assist you in determining whether the item is safe. Triumph Dining is one such resource, but there are others. (There is even an iPhone app for that!) Make sure you read labels every time you purchase an item – even if it was safe before, the manufacturer may have changed the ingredients. Allow yourself to be human. It’s okay, especially at the beginning, to grieve. It’s okay to be angry, frustrated, or sad about the change in your lifestyle. You might feel left out of certain things. You might feel like no one understands. Some days, it might just feel like it’s just too hard. That’s totally understandable. It’s during these times when a good, solid support system is essential. Your support system can always be your family and friends (I know I owe so much to my husband – he has had to learn so much throughout this process, and he’s been supportive, understanding, and flexible. Without him, I think there might have been times I would have gone crazy! ), but there are also support groups out there. The Gluten Intolerance Group has a lot of branches in North America, for instance. There are also a huge number of gluten-free bloggers out there – my gluten-free blog friends have been a great source of support for me! Fall in love with what you CAN eat. 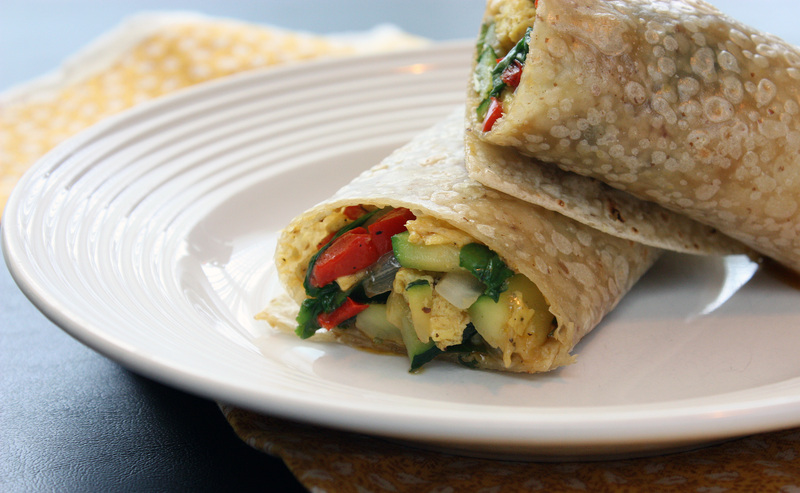 There is a bounty of delicious, gluten-free food out there. Once I mourned my “loss” of gluten-y foods, I began to shift my focus, not on what I can’t eat, but what I can eat. There is so much to enjoy. Right now, we are in the middle of the best time of year for fresh, delicious foods – I can’t get enough of summer’s juicy berries, fresh zucchini and squash, okra, tomatoes, peppers, onions, herbs, peaches…the list goes on and on. The possibilities for recipes with all of these foods are endless! For those of you that also must adhere to diet restrictions, what lessons have you learned? What tips do you have to share? Check Out The CSA Goods! (In past shares, I’ve also received a variety of lettuces, kale, mizuna, celery, carrots, peaches, and a variety of herbs.) I love receiving our shares – it’s an adventure of sorts, really. I pick it up while visiting the farmers market on Saturday mornings, and then work to incorporate those vegetables and fruits into our weekly meals. I’ve already prepared the swiss chard – I simply sauteed chopped leaves and stems in a bit of olive oil, and tossed in some dried cranberries (soaked in hot water) and a handful of toasted, slivered almonds. I plan to make ratatouille later in the week to use some of the zucchini and eggplant. The blueberries will likely be snacked on for breakfast by yours truly. I never usually make “plans” for garlic and onions – they’re used so much in our everyday cooking that they’re always welcome. I will likely cook the okra along with some jalapenos in a similar manner to this recipe, and who knows, the yellow squash might become a dairy-free version of a recipe I’ve tried at Pinch My Salt, along with the dill. As for the rest, I’m sure it will be incorporated into salads and other recipes. What always remains the same? 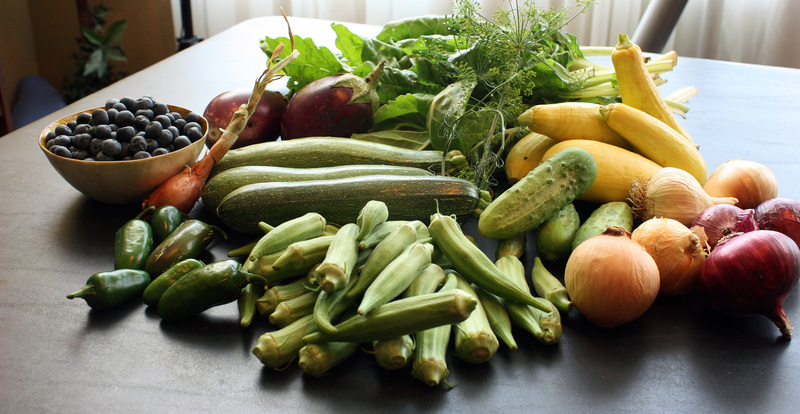 The produce from this CSA couldn’t be fresher or more delicious. Interested in finding out whether there is an opportunity near you to join a CSA? Check out Local Harvest and search! When watering the garden this evening, I discovered an invader. My parsley hasn’t been thriving as well as it did last year, and this guy is to blame. (Well, he and his brothers/sisters.) He (or she) is the third caterpillar I’ve plucked from my garden, and by far the largest – about two inches long. After we enjoyed a photo shoot, I moved him far away from my garden. 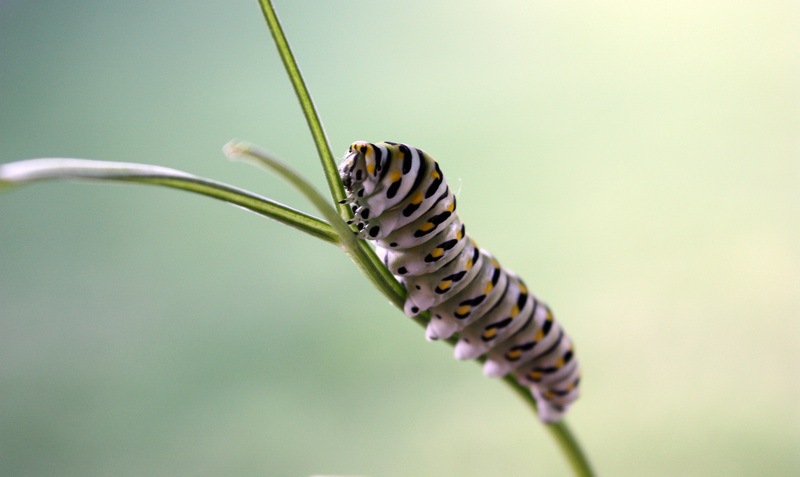 As much I know that he’ll one day become a beautiful butterfly (He is a black swallowtail caterpillar), I would prefer that doesn’t happen at the expense of my garden. Quite a gorgeous caterpillar though – I’m used to the boring green ones, so I was a bit excited to find him! Our hostesses this month, Evelyne of Cheap Ethnic Eatz, and Valerie of The Chocolate Bunny, chose delicious pâté with freshly baked bread as their June Daring Cook’s challenge! They’ve provided us with 4 different pâté recipes to choose from, and are allowing us to go wild with our homemade bread choice. Personally, I was so glad to have choices. 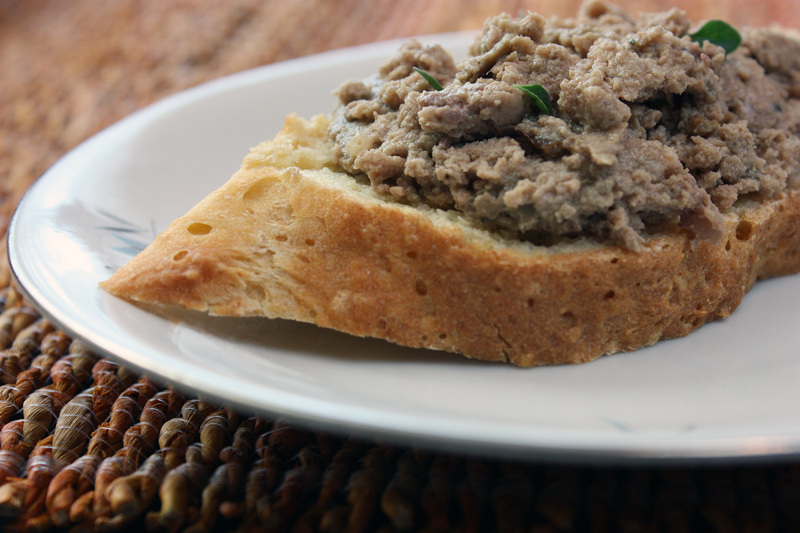 I immediately knew I wanted to try a chicken liver pâté (I have a fondness for chicken livers), but I needed to search around a bit for a gluten-free bread recipe. I’ve tried various versions, and while most have been satisfactory, they haven’t been amazing. 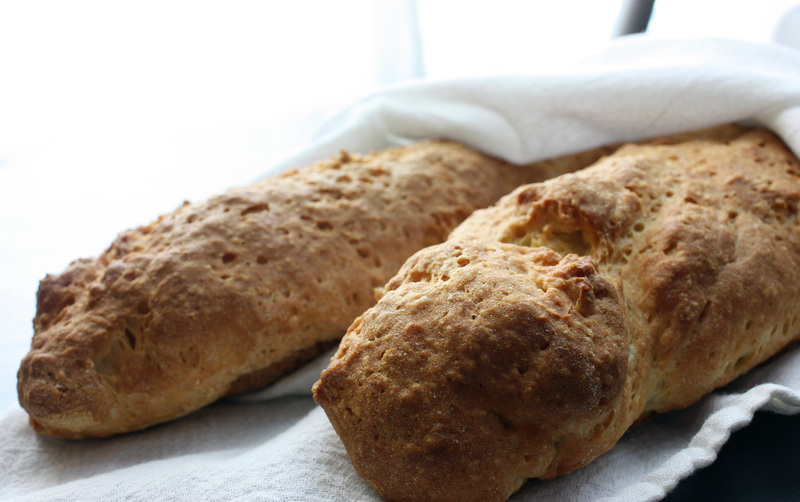 As for the baguette, I have to admit, this is the best recipe to date that I have tried. I found it from Living Without, a magazine for people with food allergies and gluten intolerance. The texture was amazing, with a chewy crust and soft center that wasn’t soggy or gummy at all. The loaf wasn’t heavy or dense (most gluten-free breads are like bricks!). It felt like real bread. My only complaint? It tasted like the bean flour, something I’m not terribly fond of. (Everyone has their own preferred baking flours.) I plan to experiment soon, substituting part or all of the bean flour with another high-protein flour. (If anyone has suggestions, I’m all ears!) 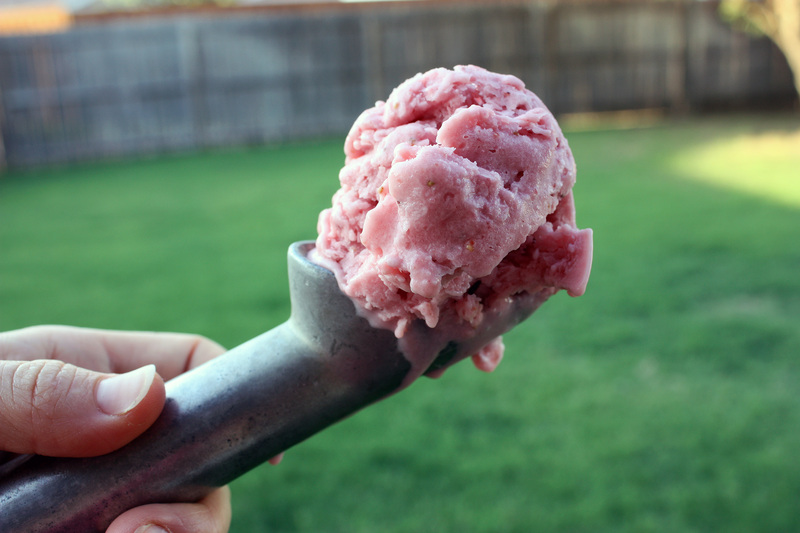 If you don’t mind the bean flours, I highly recommend this recipe – it’s excellent! This was a great challenge, and now I have an excellent appetizer recipe available for entertaining in the future! Put the water bath and the loaf pan in the oven, and bake for 2 hours. Uncover and bake for another 30 minutes. The pâté should be cooked through, and you should be able to slice into it with a knife and leave a mark, but it shouldn’t be too dry. 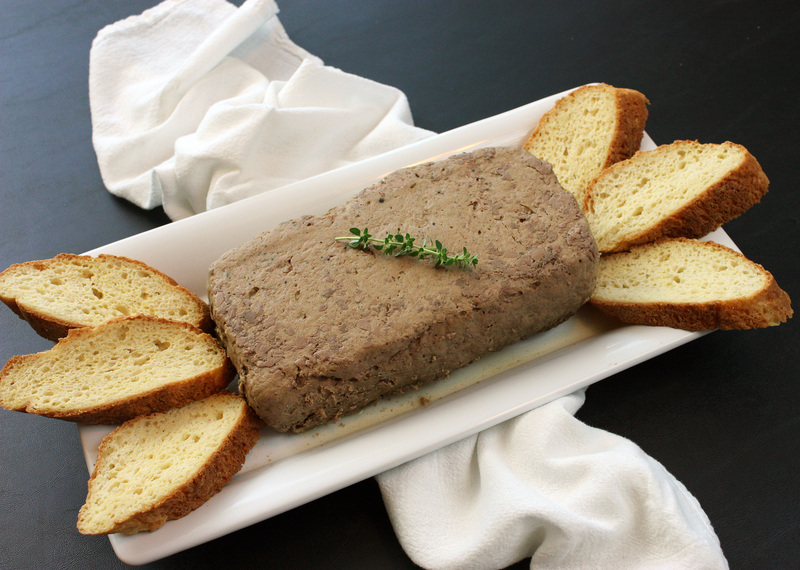 Refrigerate, as this pâté needs to be served cold. Unmold onto a serving platter, cut into slices, and serve with bread. Gluten-Free French Baguette recipe can be found here.